The remarkable story of Tara Winkler, who established the Cambodian Children's Trust to provide children with emotional security and the opportunities they need to break the cycle of poverty. How could it be wrong to save the children by starting an orphanage? Oh, in so many ways . . .
Tara Winkler first arrived in Cambodia to join a tour group in 2005 and was taken to visit a small orphanage in Battambang. The children were living in extreme poverty, and Tara was determined to raise money to help them. Two years later, after fundraising in Australia, Tara returned to Battambang only to discover that the same children were in deep trouble. Her spontaneous response was to find them a new, safe, home. With a team of committed locals and support from friends, she established the Cambodian Children's Trust (CCT). With an instant family of fourteen children and three dogs, Tara had to learn a lot, very fast. And, along the way, she realised that many of the actions she took with good intentions were not at all what the children needed - or indeed, what any child needs. CCT now helps vulnerable children to escape poverty and be cared for within their families. In this compelling, poignant and funny memoir, Tara shares the many joys and the terrible lows of her journey thus far with honesty and passion. Written with co-writer, Lynda Delacey, How (Not) to Start an Orphanage is a book that will keep you thinking long after you turn the final page. In 2011 Tara was awarded NSW Young Australian of the Year in recognition of her work with CCT and she has been featured twice on Australian Story. 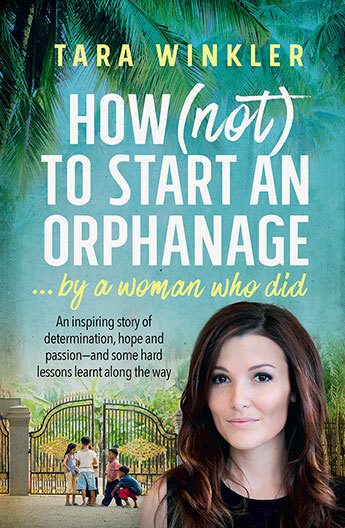 How (Not) to Start an Orphanage is her first book.